We’re still looking for a good solution to track the timeline of JSRs. We’ve created a new Trello board with the JSRs that are currently active and the stages they are in. We need to come up with a list of standard things to do for JSRs at specific stages – e.g. kick off Adopt a JSR; request feedback from the community on using it, etc. The London Java Community’s next free event is – ‘Java, Spring and Scala’ on Wednesday 11th April at 6:00pm. Presented by Jan Machacek. In his Spring & Scala tutorial, Jan will start by comparing Scala to the other languages on the Java platform. Find out that Scala code gets compiled to regular Java bytecode, making it accessible to your Spring code. You will also learn what functional programming means and how to see & apply the patterns of functional programming in what we would call enterprise code. Jan will gently introduce functions, higher-order functions and demonstrate building rich type systems. All traditional Spring & Java developers who are curious about Scala. You don’t need any Scala knowledge, but some Spring experience will be very helpful. Monday night was another great LJC event, despite starting a little later than usual. It was great to have a healthy selection of lightning talks followed by a detailed presentation on CouchDB. Once again, many thanks to all who came to the event – you are what the LJC is all about. See you at the next one! The London Java Community’s next free event is – ‘The Emergence of NoSQL and developing with Couchbase’ on Thursday 19th March at 6:00pm. Presented by Raghavan Srinivas, NoSQL has garnered tremendous attention in recent years as the basis of architectures for building large linearly scalable systems. There are a variety of NoSQL solutions for developers to choose from. As a document oriented database, Couchbase Server presents the user with a simple approach to storing and retrieving data across a cluster that handles replication, rebalancing and other inherent challenges associated with a distributed system. Using Couchbase server as an example we will walk through some of the underpinnings of the NoSQL databases such as being able to adapt to a changing schema, working over a changing network topology and so on. Couchbase Server 2.0, Open Source under an Apache 2.0 license, has constantly updating map-reduce based views and an actively managed cache from building upon it’s history with Apache CouchDB and memcached. Despite Martijn allegedly being on holiday in New Zealand for the month (though still keeping to roughly 100 emails a day), the LJC had a cracking month – one of the best yet! We had 94 people sign up, (a new record), reached over 2200 members and had over 600 active members for the first time, including a massive 672 RSVPs. All of these figures dwarfing previous records. It’s worth checking out the stats page for the LJC as our popularity is certainly increasing and we’re reaching new corners of the market every month! Well done to Andrew Smithson for winning the EuroClojure raffle. As always we’ll keep our feelers out on other give aways that we can get for you, if anyone knows of upcoming conferences we could sponsor/promote to get a free ticket for you just let me know. We also received some feedback from Casper MacRae who you may remember won last months JFokus event and wrote this write up. We have reached out to more communities too to bring you more events through Aaron’s LJC Partner Event email – as always if you know anyone that we should add let me know. We then had our regular code share. This time on Dependency Injection or “DI another day”. Some great feedback as usual for Ged and Daves event: “First time I attended. Interesting presentations and discussion. Really liked the idea.” You can read more about it and get the supplementary material here. We then had a pretty special event with Fabianne, Yara and Vinicius from SouJava. For those that don’t know SouJava is a 15 year old renowned Java User Group in Brazil. We had some pretty awesome feedback “It’s cool to have so big and active community. Was pleased to see guys from Brazil community. Yara and Vinicius Senger’s presentation about Arduino with JHome was just amazing!! !” It was interesting to hear their thoughts and genuine appreciation of the LJC. How they have watched us coming up as a younger JUG, and starting to make a lot of noise, the work that Martijn, Ben and our other organisers have done overseas has been incredible for our international profile. More info and round up here. That night we combined to also have our developer sessions. It was a different venue, despite the postcode leading people to the wrong place (sorry). We had a good combo of grads and those from the event, so it lead to some interesting discussions and I was able to recruit a few people into our new Meet a Mentor program. We weren’t sure about this one at first, but the spec lead went above and beyond to improve transparency, bring in other experts and generally do all the things we look for in a JSR. This was a final vote, and we’re pleased to announce that JSR 331 is now an official standard. also has a lot of people on the Expert Group that the LJC knows well (including our very own Ben Evans). So it was a relatively easy decision to vote YES on this one. The LJC is all about involving the ordinary developer as much as possible in the standards creation process, and removing unnecessary bureaucracy. So, this JSR (which is the 2nd of 3 “reform” JSRs) makes perfect sense to the committee. Java is one platform, and we should have one committee governing it. This was an approval ballot, but we’re hoping this JSR will progress very quickly to implementation. That about wraps it up for this month. As a reminder, the LJC JCP Committee is always on the lookout for additional volunteers and helpers. If you’d like to participate in the standards work of the LJC, please contact one of the Committee (Martijn, Ben, Trish, Richard, Mike, Somay, Simon or Barry) – we’d love to have your support. As for the recruitment side we work with many of the best Java employers in London and cover every sector from investment banking to social gaming, working with blue chips to startups. We are currently recruiting for a few positions and for those that think recruiting tech talent is tricky, I invite you to hire a good honest sales person and come back to me. We have met a great candidate though, and will keep you posted. We have a few roles involving low level multithreaded programming and concurrency. The first is within the financial industry: http://jobs.recworks.co.uk/online/ViewJob.aspx?JobId=864 the next in a gaming company: http://developercareers.recworks.co.uk/online/ViewJob.aspx?JobId=725 Previous financial or gaming, domain experience is not necessary, just a high level of interest in writing low-level multithreaded code. The roles are both permanent and paying £40-£70,000. If you’re interested let me know. Interestingly this month we have started to get a lot of interest for candidates with a combination of development and operations/testing interest. Some may have read about our Developer in Test position, we also received a junior role and have a roles for an Automated Operations Engineer – The salaries are fairly open as the company are more interested in candidates with an honest interest in this area. Let me know if you’re interested. We have also had a bit of interest for Java Developers looking into NoSQL technologies. We have an ecommerce travel company, and a gaming company interested in Agile Java developers. Ideally candidates with a classic Spring/Hibernate that are either using NoSQL products on a daily basis or just have a passing interest in Cassandra, Mongo or any of the NoSQL data stores. Please check out our events email which should be with you later this week, it will have details not only of our events but the others going on with other communities. Our NoSQL panel is about to be announced for May. We have our event tomorrow night at QCon and an event from Jan Machacek and Oracle’s Simon Ritter in the pipeline so stay tuned. QCon audience: Cheers and applause (this was unusual, though was gratefully received). All in good jest though – thankfully no rotten fruit was thrown my way, maybe we should serve beers before all of our events to get a rowdy crowd! It was certainly the biggest stage I have stood on and was awesome for us to have been invited by Qcon to organise our event within the room – massive thanks to them. It was a large venue and we had a good 150 people in attendance, including LJC members and QCon attendees. We picked up a few new members so the LJC continues to grow. If anyone has any feedback they would like to add we’d love to hear it: http://www.meetup.com/Londonjavacommunity/events/53477082/ I’m going to see if we can get slides added to this page too asap. The night kicked of with a talk from Rich Hickey talking on the Modelling Process. For those that don’t know, Rich is the author of the JVM language, Clojure. We first had him speak in London in 2009, he has a great way of making complex things simple and managed to relate his examples to everyday occurrences (forgetting to comment on his wife’s haircut was an interesting one). It was a very well received presentation as Amir Hajizamani commented: Rich is a bit of a philosopher as well as a technical genius. I would definitely recommend following @richhickey for all those interested in Clojure. Following Rich, we had Adrian Cockcroft from Neflix. Apparently he has been doing the rounds having already spoken at two other user groups this week, he still happily agreed and according to Stefan Tilkov gave “Yet another cool session on the Netflix architecture”. You can follow Adrian with @adrianco. Special thanks to Rich, Adrian and Gil. It was rare to get three high profile speakers for one evening and there was a good sense of energy after the event – which may have been helped by the fact that we had about two minutes to get out of the building. All in all a great event with an unusual amount of adrenaline for an evening about Java. RecWorks is proud to have been able to help organise the event. We have another few meetups being announced asap, if you have any subjects you would like to see a presentation on, or give a presentation on, then do not hesitate to get in touch. We are always keen on building relationships with new developers, if you’re actively looking then check out our jobs page www.recworks.co.uk/jobs to see our latest positions – if you are interested in just having an informal chat or coffee to just hear what’s going on at the moment then give any of us a shout. The London Java Community’s next free event is – ‘LJC Night at QCon’ on Thursday 8th March at 6:30pm. With great help from the organisers of QCon we have been able to secure three speakers that are rarely available in London for a special LJC event held at QCon. We are lucky to have with us: Gil Tene of Azul systems, Adrian Cockroft of Netflix and the creator of Clojure, Rich Hickey. The event will be held at The Queen Elizabeth II Conference Centre from 18.30 to 20.30 on Thursday 8th March. The original “memory wall” first predicted in the mid 1990’s was supposed to have been hit by now, with applications stretching server capabilities to their limits. However, today’s typical application instance only utilizes 5-10% of a modern server’s capacity, and the percentage is dropping. In this session, Gil will discusses the “Application Memory Wall” and and the likely causes of an observed decade-long stagnation in application instance memory growth and consumption. Gil will analyze the key technical challenges that have led to the emergence of the Application Memory Wall, reviewing the relevant state of the art in garbage collection within managed runtimes in general, and in commercial Java Virtual Machines in particular. Gil will outline the main technical problem areas that need industry and academic attention and focus. Gil will then dive into the details of an actual collector (Azul’s C4 garbage collector, http://dl.acm.org/citation.cfm?id=1993491) that addresses the identified set of problems, and show how such solutions can lead to a post-Wall era – an era in which applications will once again be free to productively and naturally consume the abundant compute resources available in modern servers. Netflix has used Java for many years, as we moved to run our streaming services out of the cloud, we wrote a highly automated scalable global platform in Java, which we are now open-sourcing, git by git. This talk summarizes the basic features of Astyanax, Priam, Servo, Curator etc., which are available at github.com/Netflix and are described at techblog.netflix.com. Adrian will also describe some interesting Java “faceted type” constructs that provide a kind of multiple-inheritance for business level objects. Who should attend: Developers and architects concerned with building large scale systems in Java. Rich Hickey (Creator of Clojure) will present “Modeling Process”. Time, perception, values, identity, visibility, state, persistence, memory, transience, process, place, change, communication. We use these terms everyday. Yet, despite its real-world modeling flavor, OO has little to say about them. What do these terms mean, and why do they matter to our programs? Caspar Macrae recently won a trip to Jfokus 2012 through the LJC. 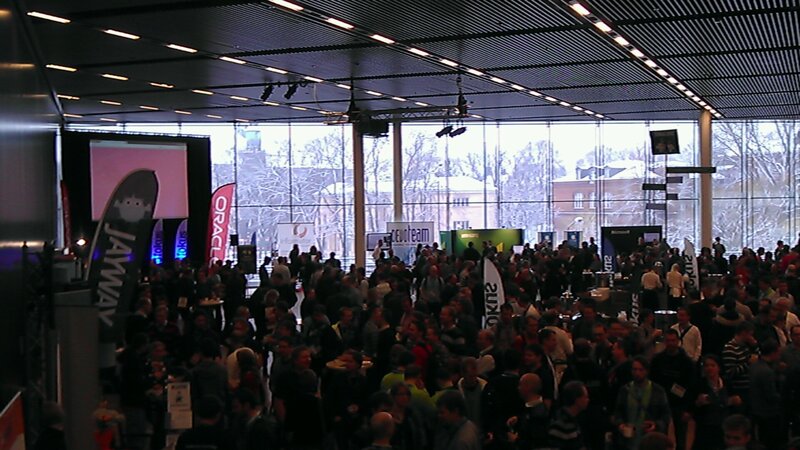 Here is his experience..
Jfokus 2012 was held on 13th to 15th of Feburary in Stockholm at the Waterfront Congress Hotel. 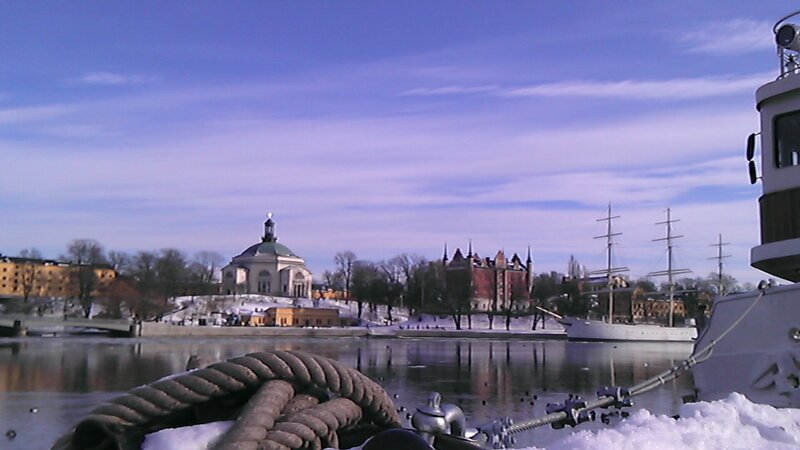 Stockholm is a truly beautiful city, an archipelago spanning 14 islands connected by bridges, and at this time of year, miles and miles of solid ice. On the Tuesday evening there was a free bar which was very welcome given the temperature and amount of snow outside (enough to stop every public service in the UK, but not enough for the average Swede to notice). Cliff Click (Azul Systems) gave some very entertaining and energetic talks on the JVM and succinctly broke down typical problems with micro-benchmarking. Angelika Langer (Angelika Langer Training/Consulting) drew a number of oohs and ahhs in her talk covering Lambdas in detail, along with several other Java 8 features. James Strachan and Claus Ibsen (Fusesource) gave a good talk on Camel for EIP – a laptop issue meant they couldn’t demo the FuseIDE, but as we’re using Camel I’ll definitely be giving the GUI management a try soon. Kevlin Henney (Curbralan) gave a stunning presentation on OOP in Java (or how Java isn’t object but actually class oriented), it was witty and insightful throughout. Along with the main theme, he showed how the canonical implementations of Object.equals(Object) violates SRP and later horrified the audience with the revelation that COM is pure OOP. His talk made a good companion to the works of Uncle Bob and I left feeling enlightened. 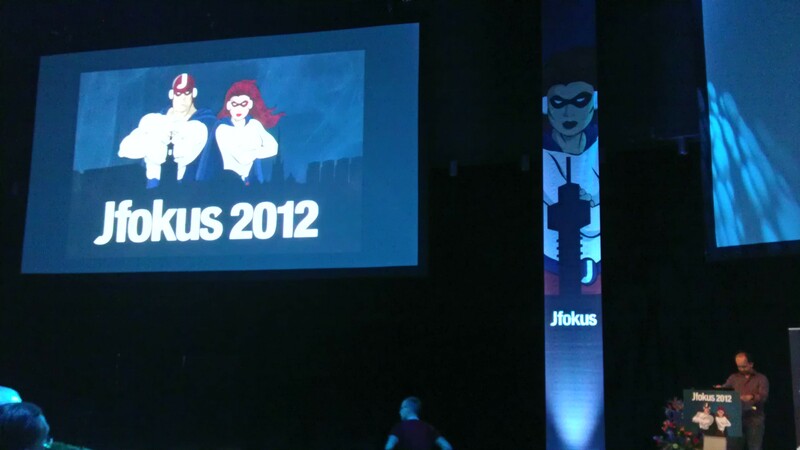 I’ve been to a few conferences (in the UK, JAX etc) which have been a great source for learning and motivation – glad to say Jfokus was no exception. I returned home brimming with ideas, with a long TODO list of cool stuff. In order to continue our commitment to openness and transparency in the JCP we’re publishing our reasoning for the votes that occurred in February. For a description of the overall criteria we use for voting you might want to read https://londonjavacommunity.wordpress.com/sign-up/page/2011/11/08/what-we-look-for-in-a-jsr/. This is a Final Approval Ballot – which means that the standard has already been designed and worked upon and this vote is a final decision as to whether to approve or reject the standard. JSR 331 itself specifies an API defining a operations used to define and solve constraint satisfaction style problems. Initially the LJC expressed some concern that whilst the API was of use the Expert Group was quite small, after the Expert Group broadened to include more user participation our concerns were alleviated and we had no issue voting yes. The API itself is based upon several academic works and different implementations over a sustained period of time and is a refinement of this work, so we believe it would work well as a standard. It also meets our transparency criteria since it has a publicly writable discussion forum, and the expert group business is publicly reported upon. The reference implementation is open source. Both 354 and 355 are approval ballots. This means that they are JSRs that are at the very beginning of their process and this vote is whether to start standardising in this area. The LJC’s own Ben Evans is a JSR 354 Expert Group member. We believe that money and currency related problems are a common use-case in many industries and that the existence of several existing APIs and a wealth of proprietary internal APIs provides a clear motive for standardisation. The Expert Group contains several User Participants. Its running under JCP version 2.8 – which means it also meets our transparency requirements. JSR 348 began the process of improving the Java Community Process itself by making it more open and transparent, JSR 355 is the next step of the JCP reforms. At present there are two committees: one for Java ME, and one for Java SE/EE. In the near future Java ME will have its specification reworked so that its closer to Java SE, in order to allow people to transfer their skills to embedded and mobile developers more easily and in order to bring the APIs and language more up to date. In conjunction with that process JSR 355 describes how the ME Executive Committee will be merged with the SE/EE Executive Committee. The LJC is supporting this committee merge because it makes the constituency of the executive committee more reflective of the underlying technology developments. As part of our commitment to JCP reform the LJC has two members on the JSR 355 Expert Group: Ben Evans and Martijn Verburg. An initial concern was raised with the JSR allowing charges for JSPAs, however, Martijn has received clarification from Oracle that this is only to be used in order to discourage any attempt by an organisation to vote-stack the election process. Last week on Thursday, we had another LJC event at the Skillsmatter exchange on ‘Concurrent Programming using the Disruptor’. As you may have heard recently, the Disruptor is an open source concurrency framework developed by LMAX. It has attracted a lot of attention lately and we were lucky to have LJC organiser Trisha Gee to give us the low down. We kicked off at 6.30 and got straight to the main event. Trisha took to the stage and showed us how concurrency could be made easy. The slideshow dismantled the framework piece by piece and made it relatively simple to understand. Great to see everyone’s passion, throwing so many questions her way afterwards. After the event we all went to the White Lion pub for a few beers and some networking. I can always appreciate a drink and chat with some of London’s finest developers, if you ever see me down at an event feel free to come and say hello. I’m personally interested in understanding more about the Java ecosystem. I am a self-confessed tech geek and although I am not a programmer, I am working to try and understand the intricacies of the platform so I am grateful for any advice I can get. Massive thanks to Trisha for the presentation, for those interested, I would highly recommend keeping up to date with Trisha’s blog http://mechanitis.blogspot.com/ or Twitter (@trisha_gee). If you are interested in more details about the Disruptor – you can read it here http://code.google.com/p/disruptor/. Trisha will be delivering this very same presentation at QCon next week, so if you missed it here, then you can catch it again live next week or watch the video here http://skillsmatter.com/podcast/home/the-disruptor/js-3798. Thanks to Skillsmatter for kindly hosting another LJC event, always a pleasure to visit the headquarters. Finally big thanks go to all the LJC members that made it out last night; this is one of the most active Java user groups in Europe and it?s only possible because of you guys. If you would like to get more involved in these events feel free to get in touch with Martijn or Barry. We at RecWorks are proud to have been able to organise another event for the LJC. RecWorks is a specialist consultancy blending social networks and recruitment services to provide first class service to our clients. We pride ourselves on building long term relationships with everyone we meet and being trusted advisors to the Java industry. For a list of our latest jobs please see our jobs page here. Feel free to follow us on Twitter as well, we often post stuff about the LJC and Java in general. Shameless plug at myself? I?m also on Twitter (@abrecworks) – feel free to follow me – I try to post as much as I can about events and other Java related news. We have two events coming this week: March’s Code Share: First Expressions on the 7th March (Wednesday) http://www.meetup.com/Londonjavacommunity/events/52643562/ and LJC night at QCon on 8th March (Thursday) http://www.meetup.com/Londonjavacommunity/events/53477082/ – hope to see you down there!